The Hamilton Co. is scheduled to break ground Thursday on a $14 million apartment building at 1085 Boylston St. in Boston’s Fenway neighborhood. Located near Ipswich and Hemenway streets and the Berklee School of Music, the six-story building will house 30 one-bedroom apartments, each averaging about 600 square feet of living space. The development will have parking for 18 vehicles. Rents will average about $2,000 per month. To be built on a parking lot the Hamilton Co. bought in 2011 for $2.6 million, the 28,860-square-foot development will boast a "green roof" that includes trees and landscaping that is accessible to residents. 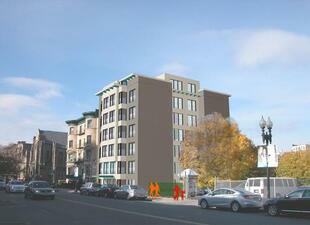 Its facade will be masonry and glass similar to other buildings in the Fenway. Harold Brown, the Hamilton’s Co.’s founder, said the net proceeds from his latest property will go directly to the community through the Hamilton Co. Charitable Foundation. He said the property should generate more than $200,000 annually for community organizations when fully leased. Brown said the foundation has contributed more than $1.2 million to 50 community organizations and schools since 2010. The Fenway neighborhood has a number of newer apartment communities including Trilogy and 1330 Boylston, projects competed by Samuels & Associates, where rents start at $2,900 for a 623-square-foot, one-bedroom unit.